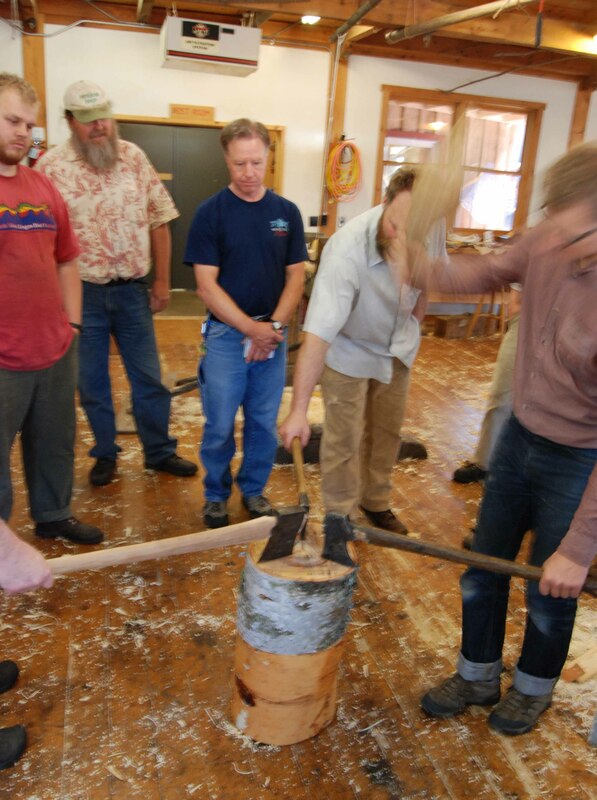 Later, Deneb Puchalski showed me his take on it during a spoon class he & I did at Lie-Nielsen. 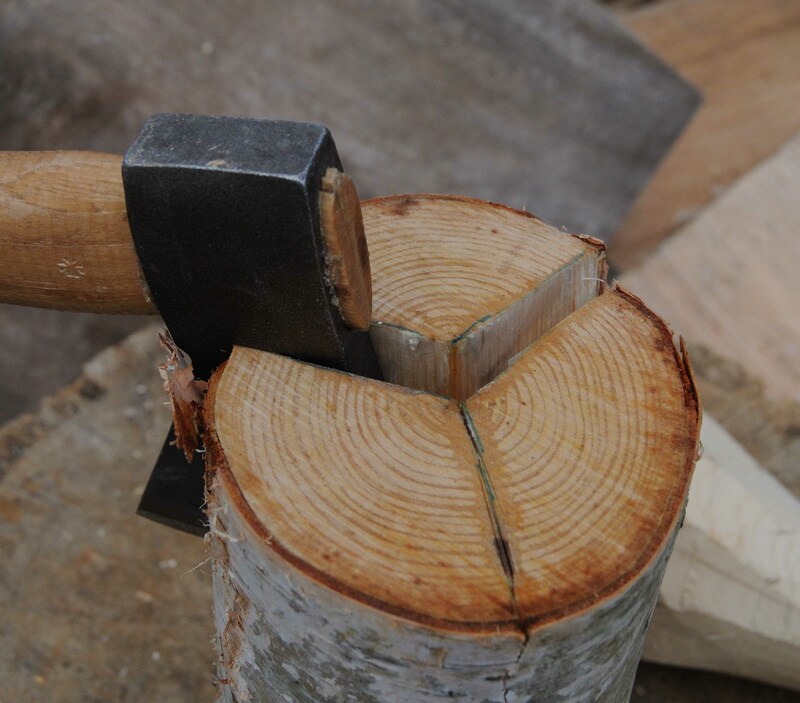 Here’s a grey birch bolt, about 5″ in diameter, that I split in thirds. This small stuff you just need one hatchet, no helpers. I started by drawing a peace sign, or Mercedes Benz insignia on the end grain. 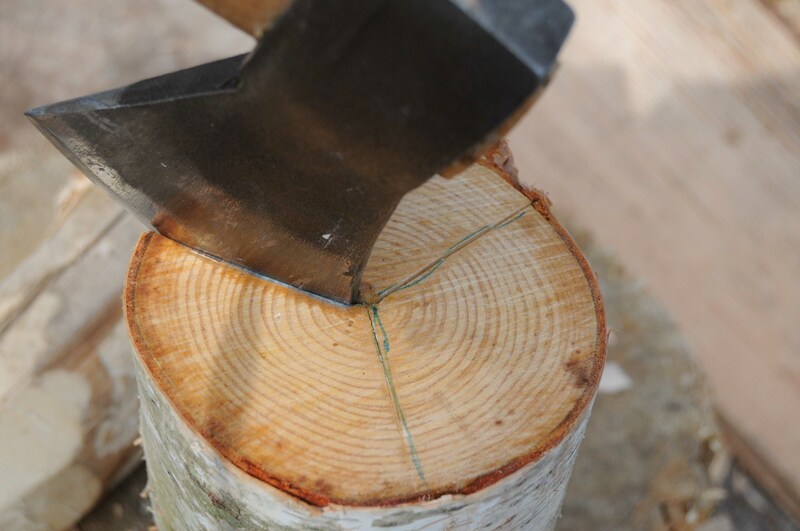 Or forget that stuff, and drawer three lines from the pith out to the bark, dividing the piece into thirds. 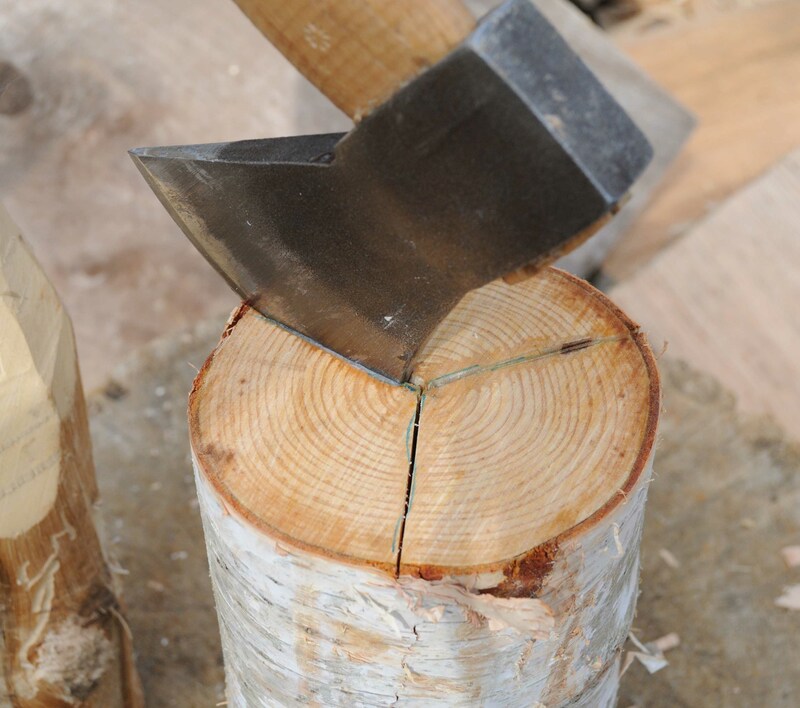 To start the split, take a hatchet and put its toe right at the pith. 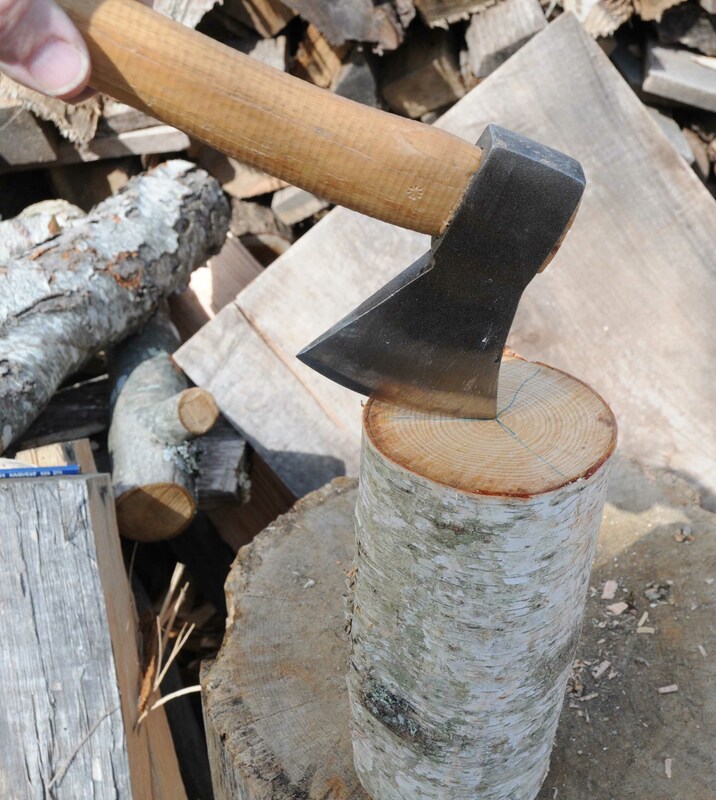 I tilt the hatchet so only its toe is hitting the wood. The last thing I want is this split to go past the pith in the other direction. Give it a knock with a wooden club. Not too hard, I just want to start the split. 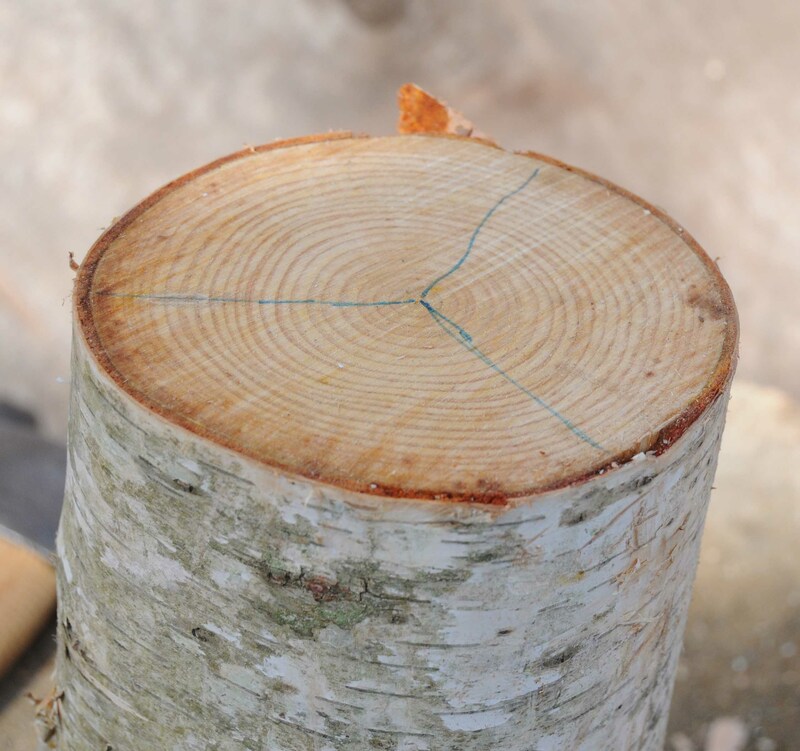 Then take the hatchet out, turn the piece and do the same for the other two radial lines. Keep going around and around, and each time whack it a bit harder…and the splits will begin to develop. At a certain point, you just are committed and drive the hatchet all the way. It usually does this – knocks one third out from the other two. 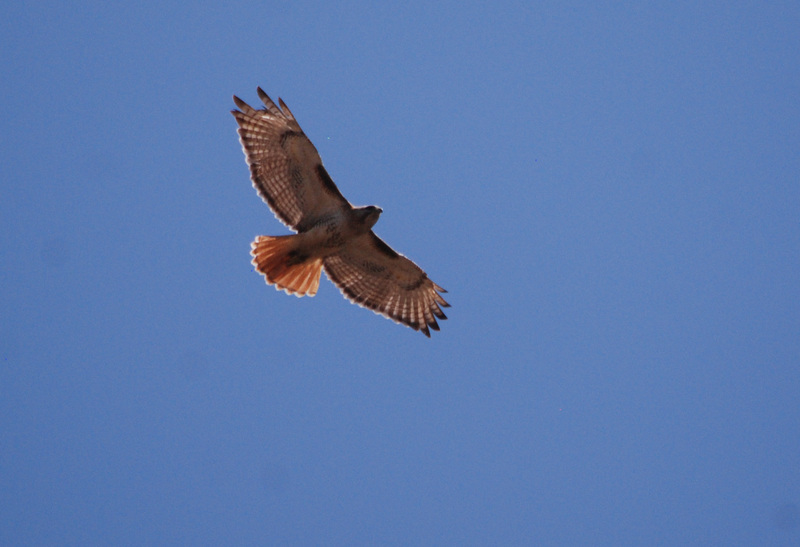 Red tail hawk from today. The closer you get to the end of the year, the faster time goes by. Maybe the older you get the faster it goes too. Paula, Pret and I have started sorting out stuff for Greenwood Fest, who’s doing what, etc. But in the meantime, we have a few courses closer to the horizon. 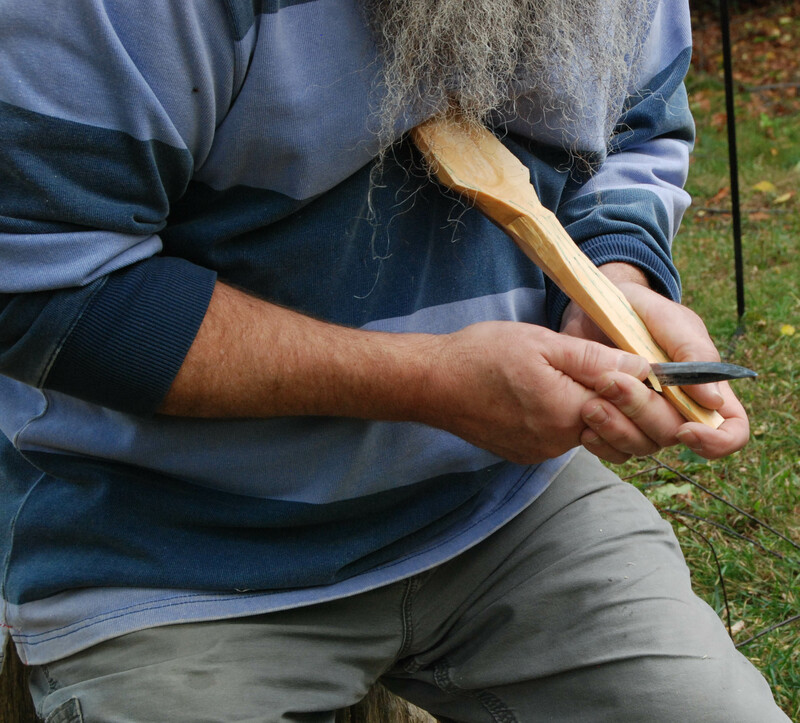 There’s a spoon carving class coming up in early December at Overbrook in Buzzard’s Bay. 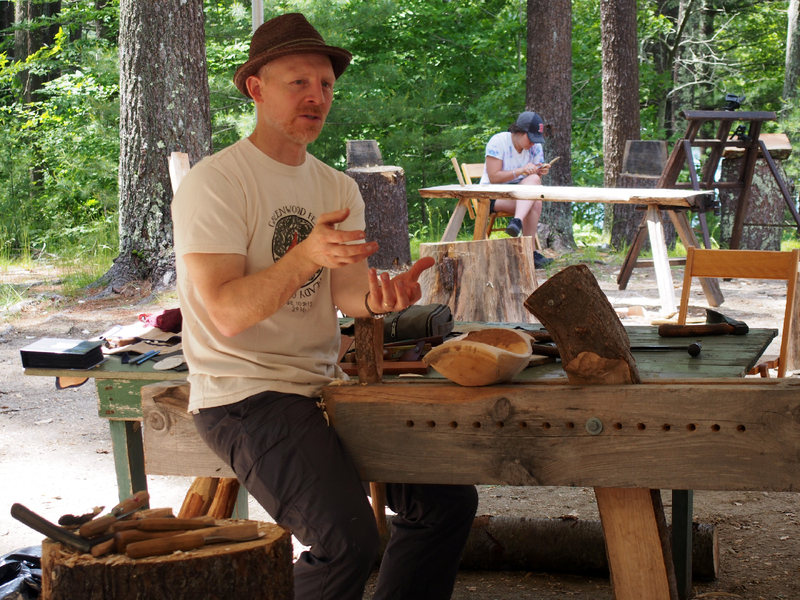 Then the following month, after all the hubbub dies down, is Tim Manney’s sharpening class. This class is a deceptive thing. 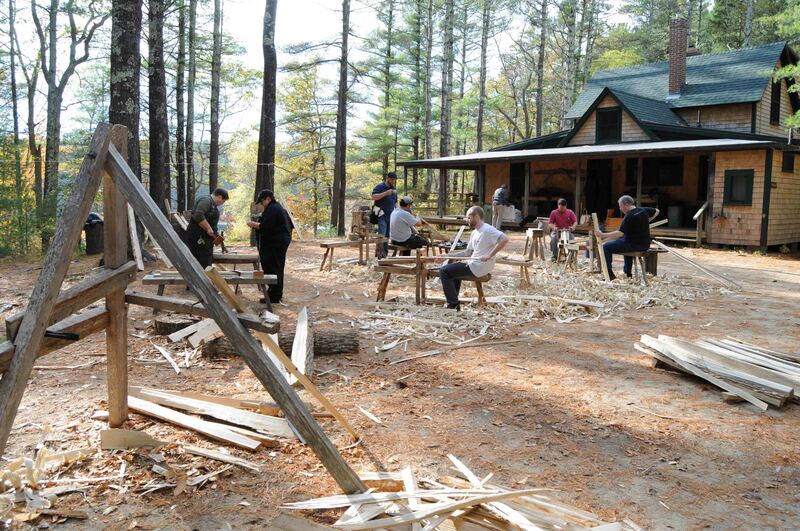 Sharpening classes are not as glamourous as a project-based class, but the skills you develop in this class reach into every aspect of your woodworking. Tim gets things fiercely sharp, and is an excellent teacher. 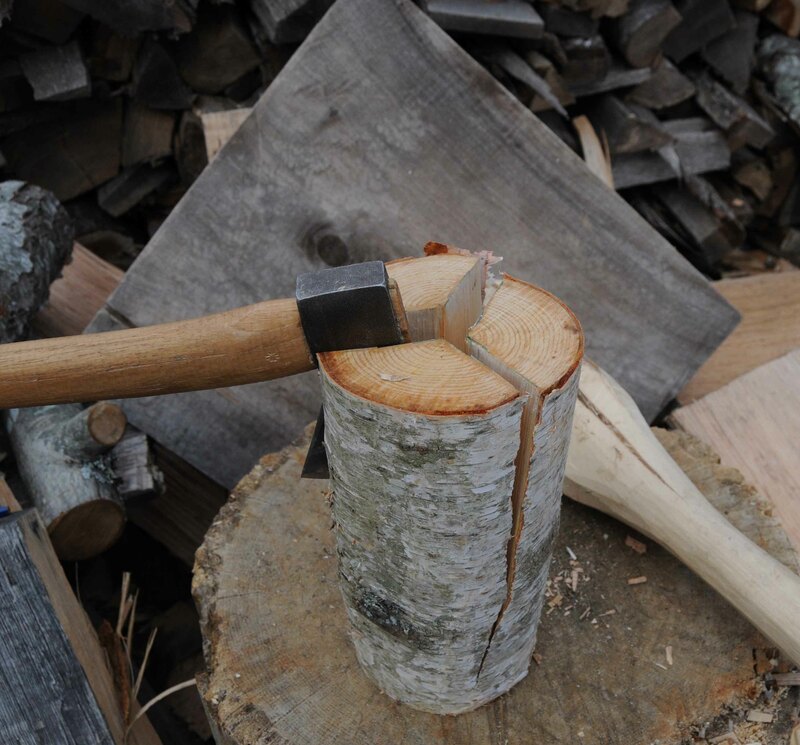 https://www.plymouthcraft.org/an-axe-to-grind Last year, people were scooting around asking “what else can we sharpen?” – I’m going to be around for it, and I’ve been cleaning my loft out in the shop. I plan on bringing a box of tools that will be free for the taking – but you’ve got to sharpen them! Hope to see some of you there…or beyond. today’s post is just a “save the date” sort of thing. 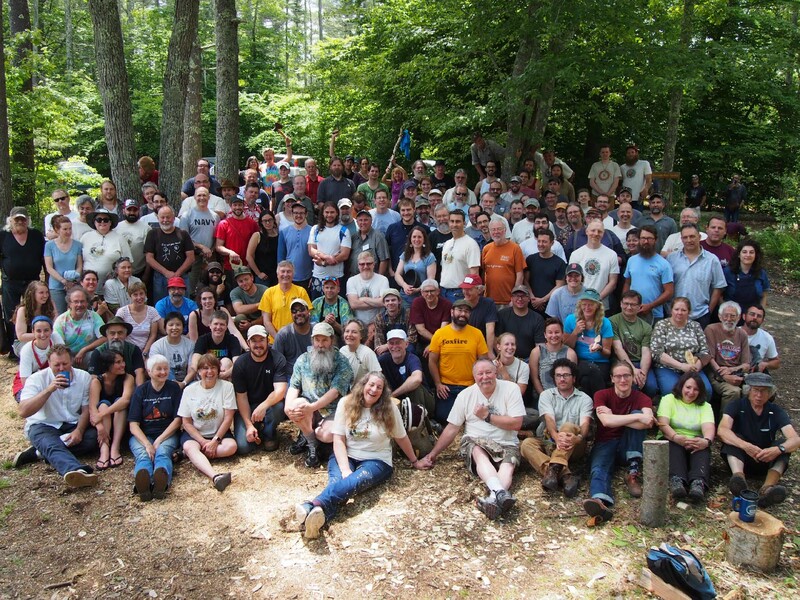 Plymouth CRAFT’s Greenwood Fest will be early June again, same venue = Pinewoods Dance Camp, Plymouth, Massachusetts, USA. Festival June 8-10; pre-Fest courses June 5-7. TICKETS GO ON SALE FEBRUARY 2, 2018. 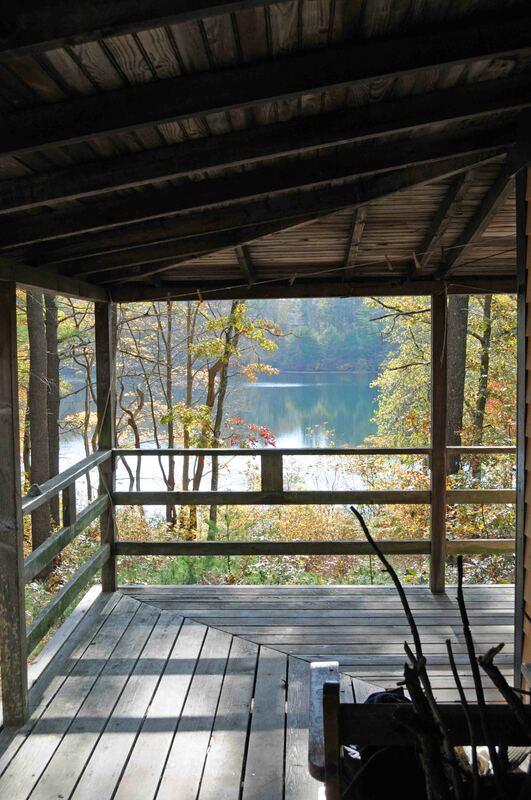 We will let you know details as we get it together – this is just so you can get the time off of work, quit your job, cancel graduation/wedding, etc and tell your family you’ll be in the woods. 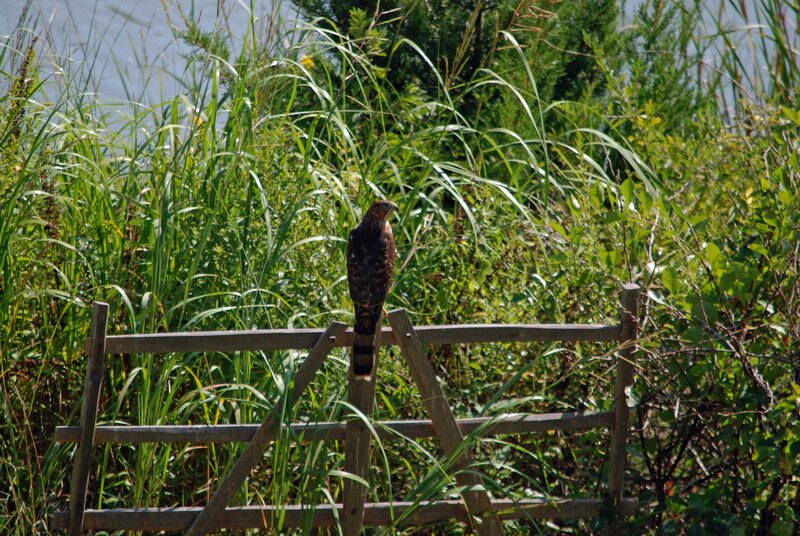 I’ve been slow to add stuff to the blog here. Time to correct some of that. 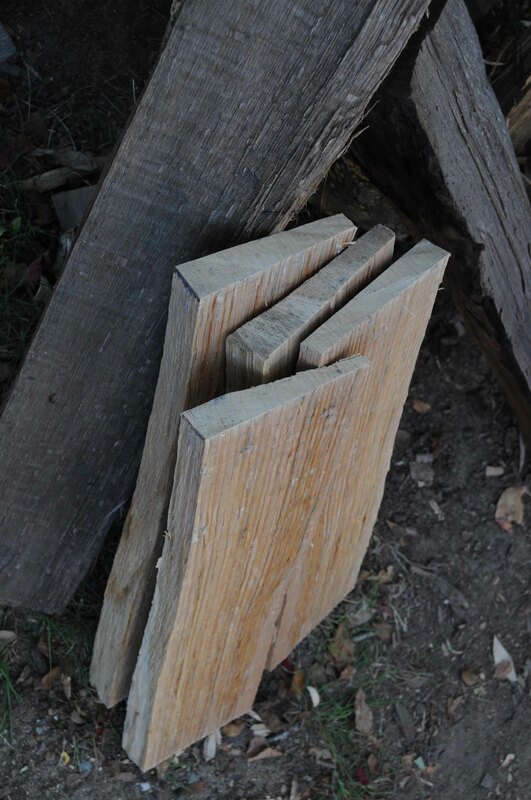 Today’s chore is splitting up some leftover bits of oak, and some newly dropped-off bits. Here’s how I read these, and how I decide what to split from a few different bolts. the first one is an old one, been split & hanging around a long time, over a year I’d say. It was given to me about 2 months ago. Free wood is sometimes not worth it. this is one of those cases. Note how the radial plane is cupped. This isn’t from drying, it’s the way the tree grew. 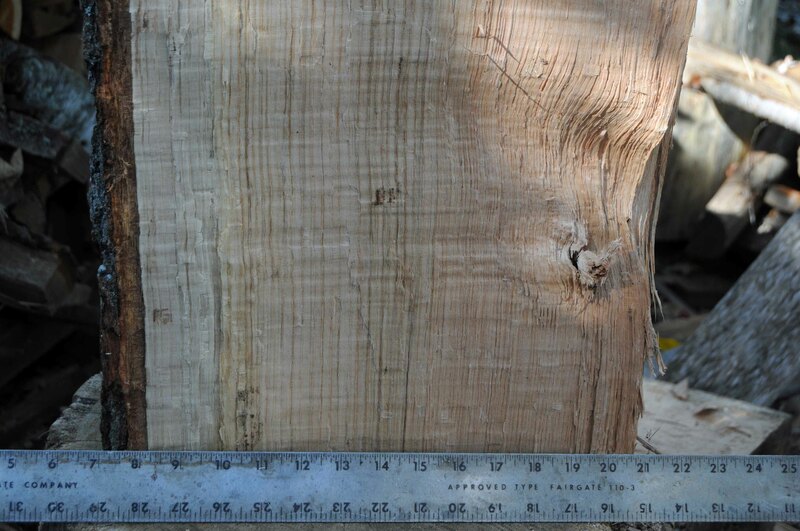 The medullary rays curve from the center of the tree to the bark. So if I want wide flat stuff from this, I have my work cut out for me. 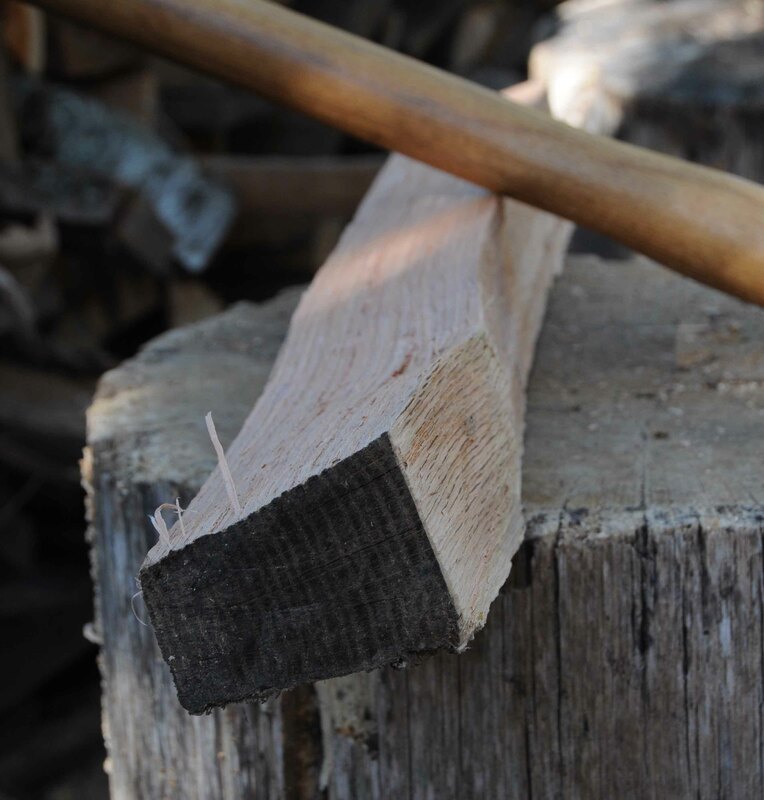 What I do with such a piece of wood depends on several things: what I need at the time, how much effort I want to put into it, and how much other wood I have around. 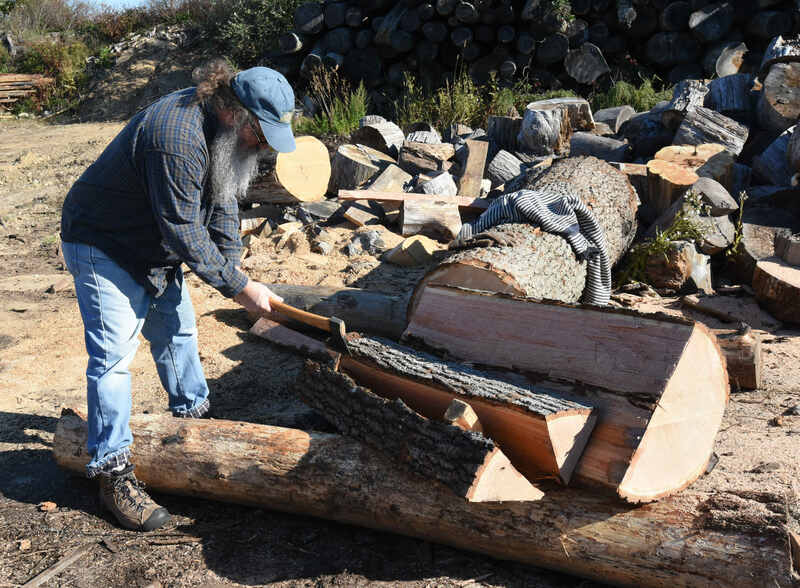 These days, wood is in pretty good supply, time much less so. Thus, I want to get the best piece I can from this as quickly as possible. The ruler shows how “un-flat” the split is. 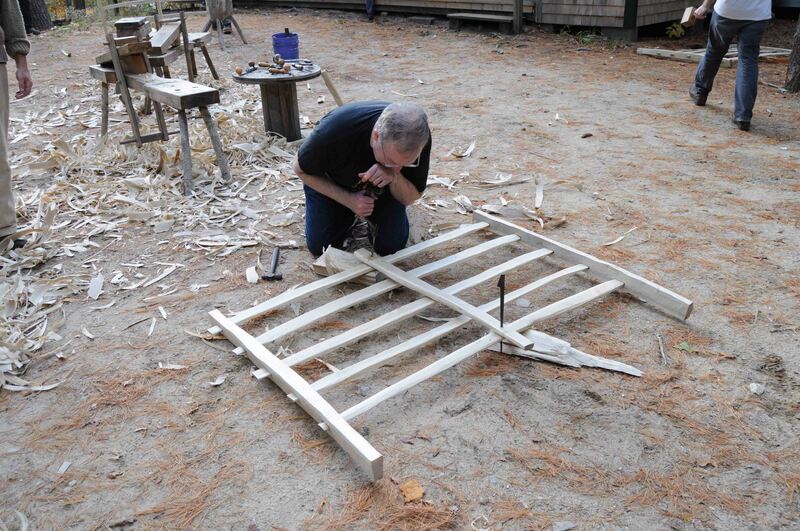 The piece was 26″ long, but with the checking at each end, I expect to get about 22″ length out of it. 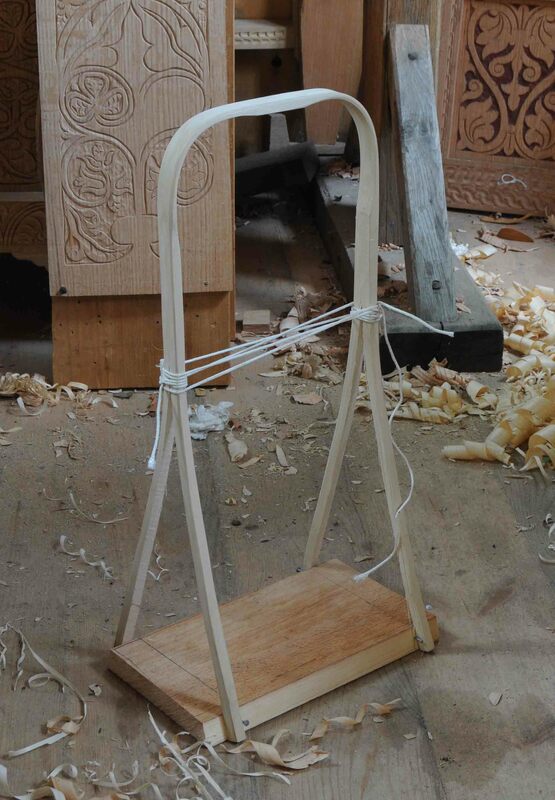 Just right for a joined stool stile (leg). 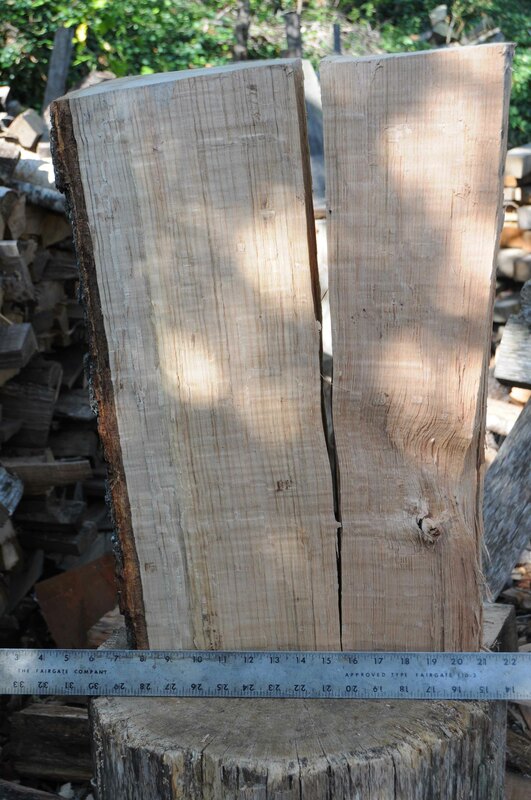 So I opted to split a 2″x 2″ square out from right below the sapwood. First split with the froe gets off the inner twisted bits. And there was – some deformity curving the grain near one end. So didn’t get my 2″ x 2″ x 22″ stile. The resulting piece could be a ladderback chair front post (something I want to build, but have no time for right now. 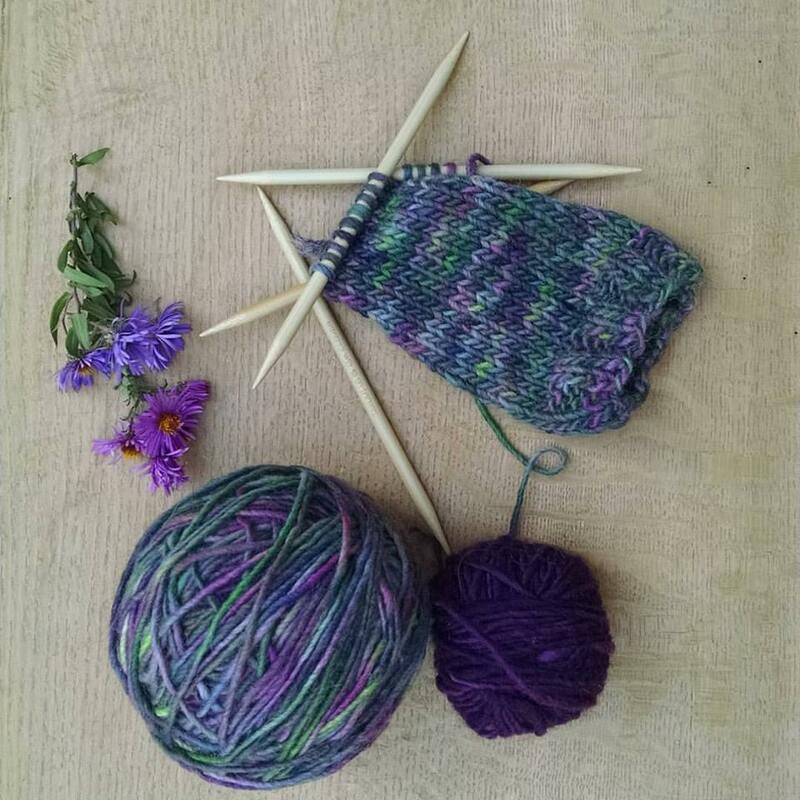 I’ve made parts for 3 of them so far this fall.) 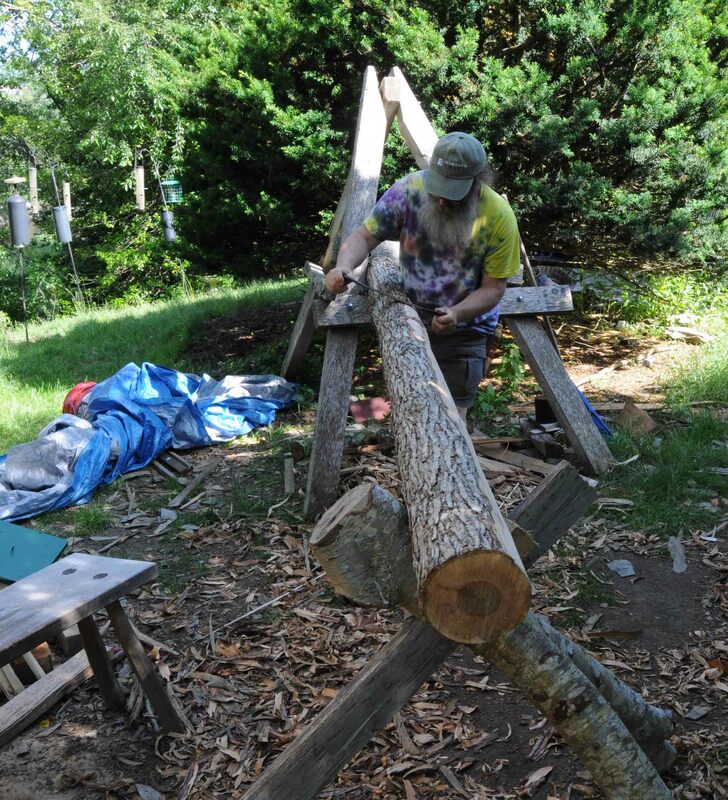 or the leg to a workbench out in the yard. I already have maybe 4 of those benches. On to the next split. This one’s big & fresh. Just came in yesterday. Bark looks good. Very wide bolt, maybe 12″ or more. But a big knot creating disturbed grain all around it, the full bottom third or more. 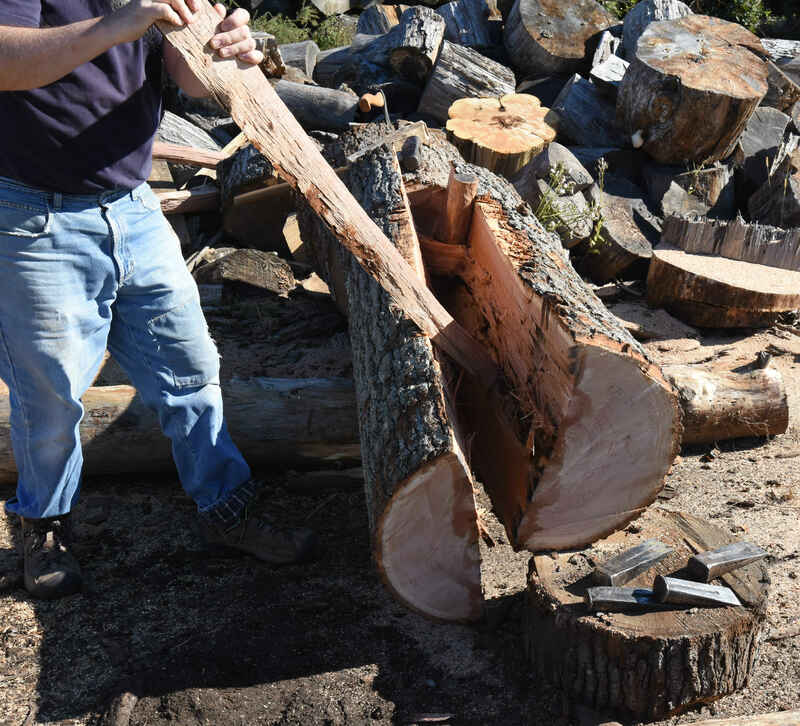 I always am working between getting the biggest piece (widest) I can, or getting the best piece of wood I can. Usually I want the best one. Which in this case, is much narrower than what I first expected from a section like this. See the ruler here, the best (straightest, flattest, least-work) piece is from the 10″ mark to 15″. So that’s what I split. Now the distorted stuff is isolated in the right-hand section, destined for firewood. Then I further split the remaining stuff into four thin boards for carved boxes, or narrow panels for the sides of some chests. Once I don’t think about where they came from, these are excellent clear, straight boards. This is a case of free wood that is worth it. One of the older bits looked promising: wide, maybe 7″ or more. 24″ long. 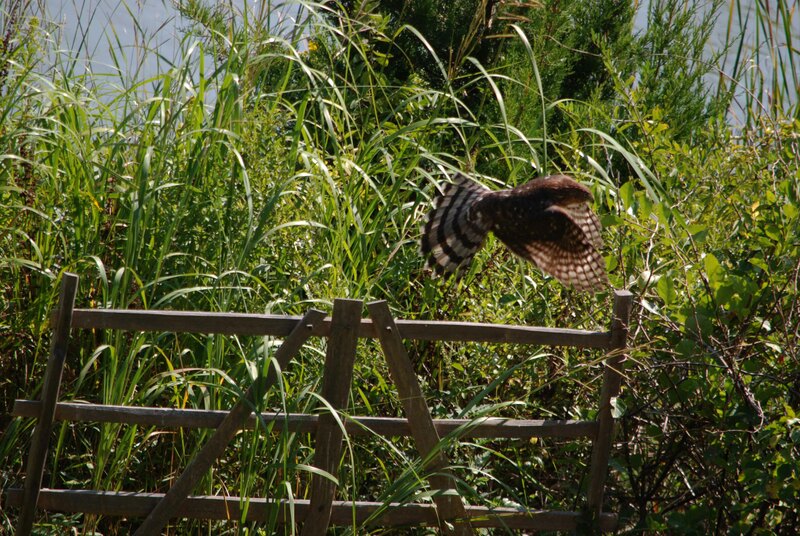 But when I sighted down its length, lots of twist from one end to the other. I didn’t shoot it well enough, but you can generally read the twist down at the far end. Its right hand corner is high, as is the left corner nearest us. 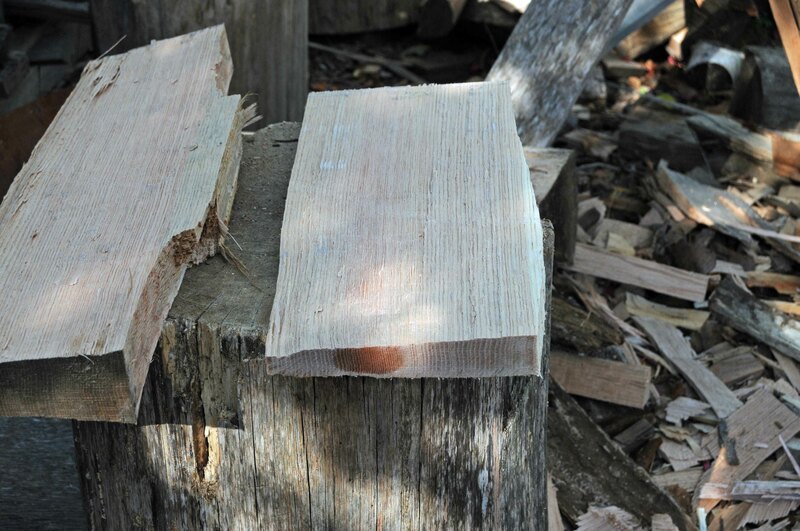 Means some hewing before planing. Not fatal, but maybe there’s better wood out here. Yup. Fresh too. (that means easier to work…) Shorter, but wider. Gonna have lunch and find some more like this one. 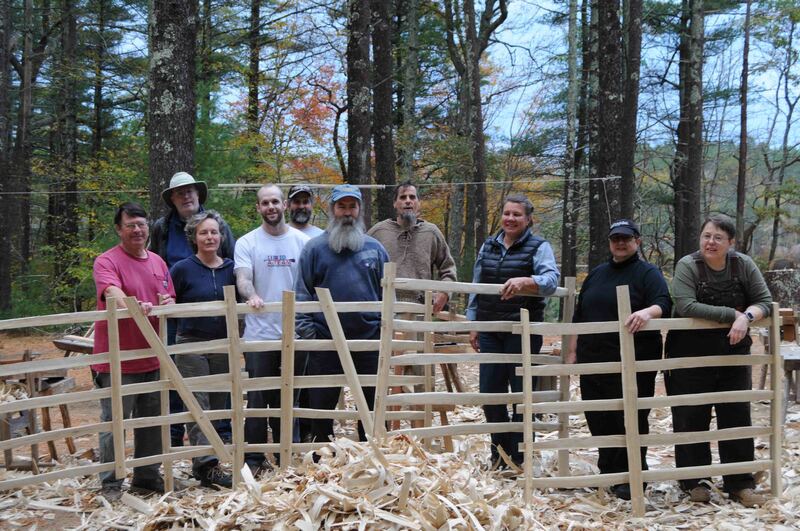 Riving, hewing, drawknife work. 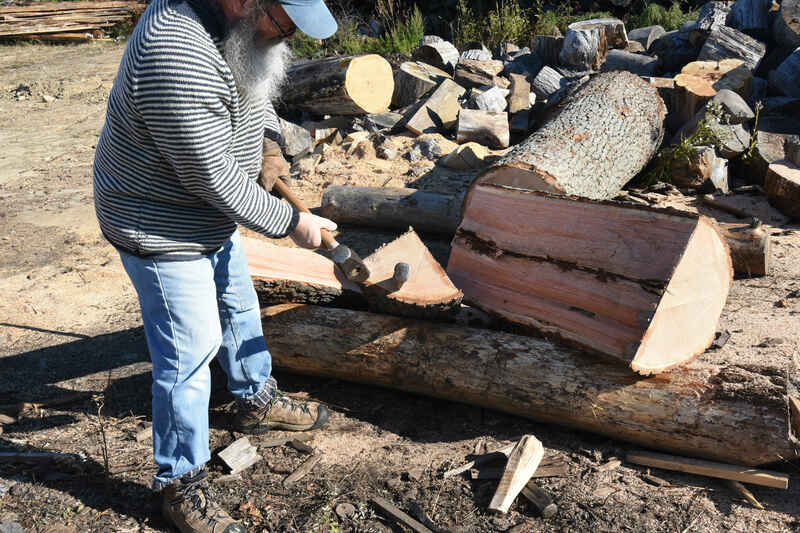 Me, Rick McKee ( https://www.instagram.com/medullary_rick/ and https://blueoakblog.wordpress.com/ ) and our friend Pret Woodburn will show you all we know about opening oak logs and what to do with them. There’s Paypal buttons for the books & DVDs, if you want a spoon, leave me a comment. Meanwhile – Hickory Bark. 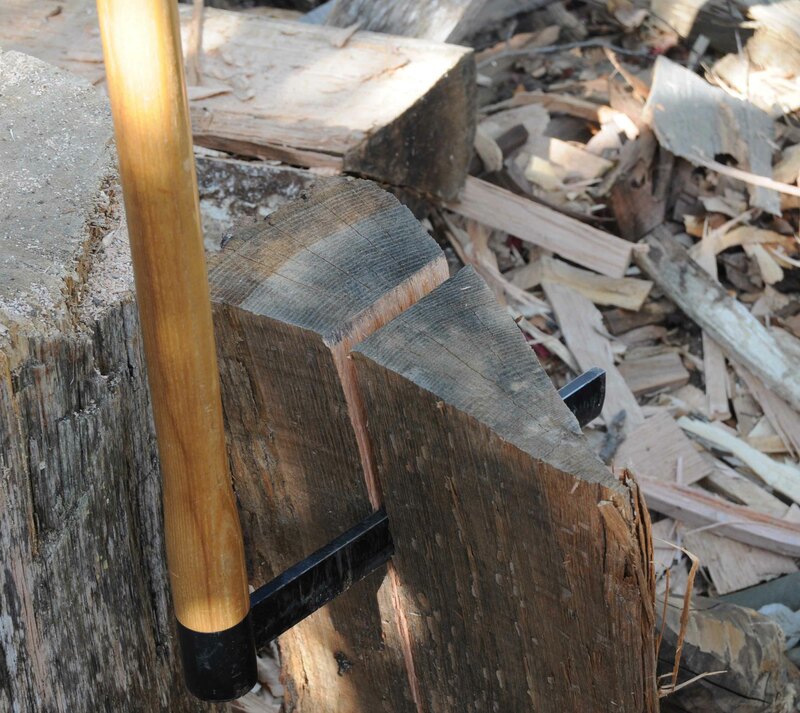 No waiting when there’s a hickory sapling cut in the spring. You gotta get right to them. So two of these were first priority once I unpacked. This work takes me way back. Way, way, way, way back as Van Morrison would say. 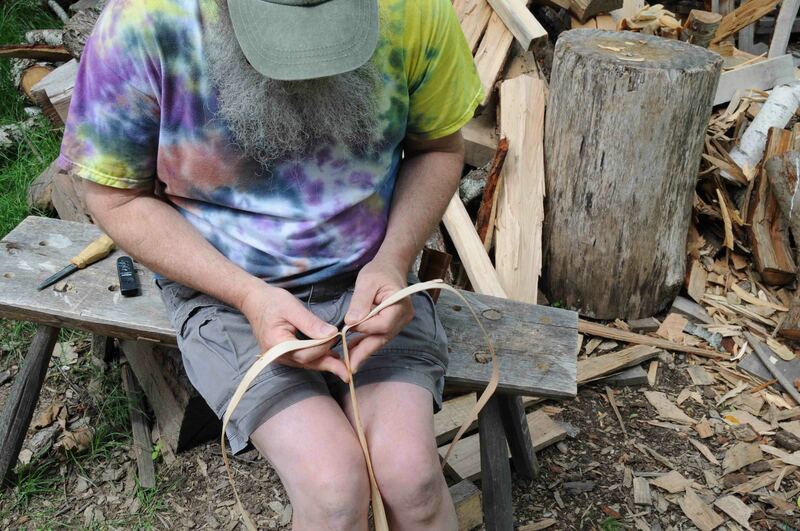 I grabbed the leftover hickory saplings after Tim Manney’s demo at Greenwood Fest (one got stripped before I got to saving it – Tim? Pete?) 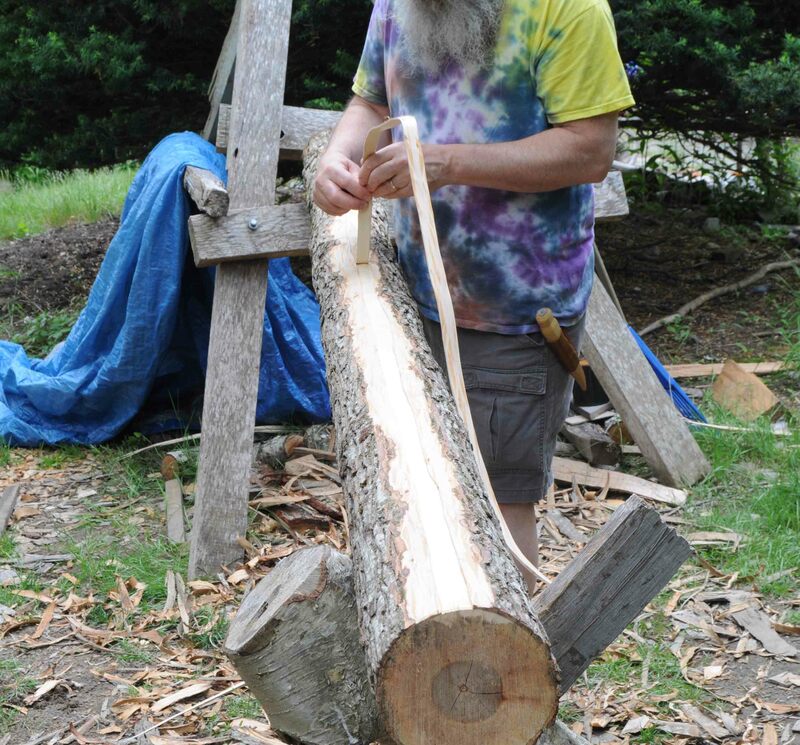 to harvest the bark. 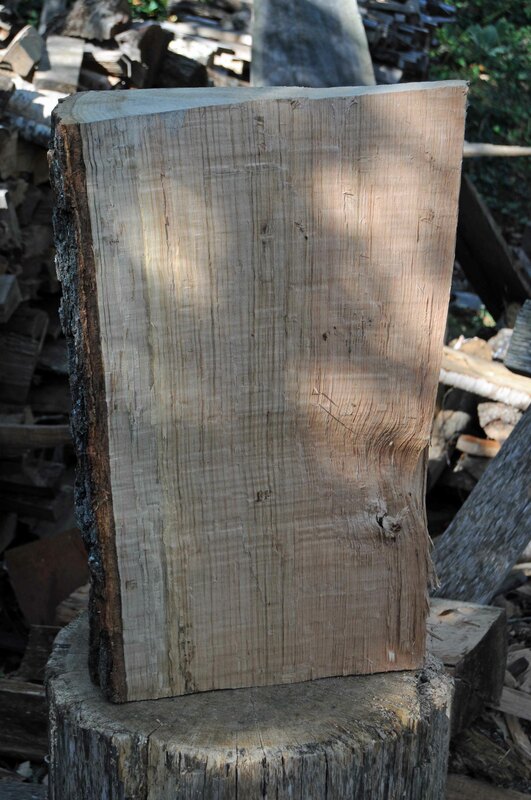 I’ve only have a few chances to strip hickory bark in the past many years. Not making chairs or baskets with any regularity meant I didn’t need to pursue it. 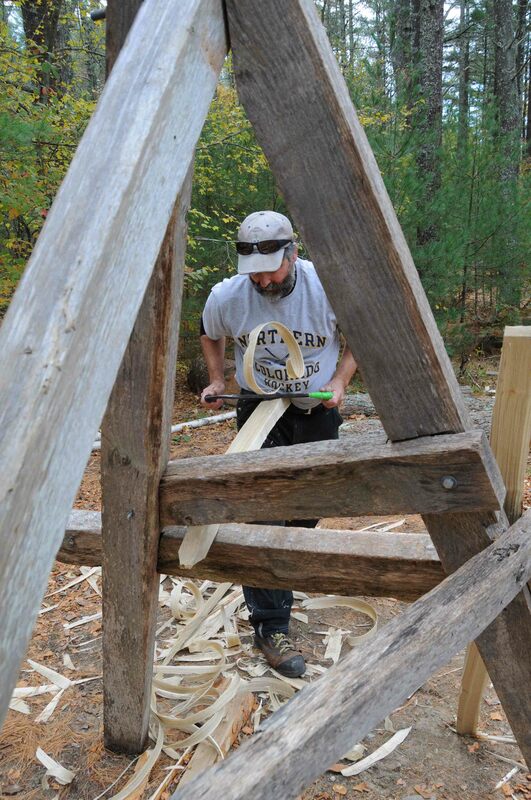 But, these were right there, and I have some ladderbacks underway, as well as some baskets that need rims & handles. 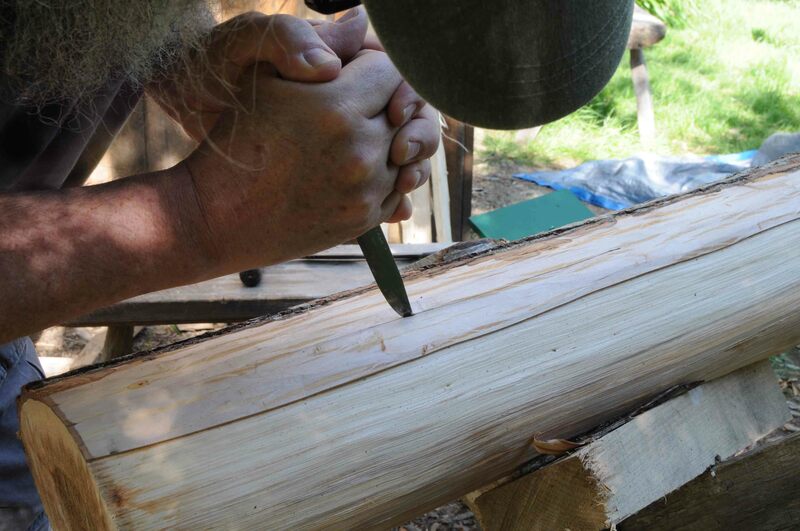 First off, I shave the outer bark off with the drawknife. 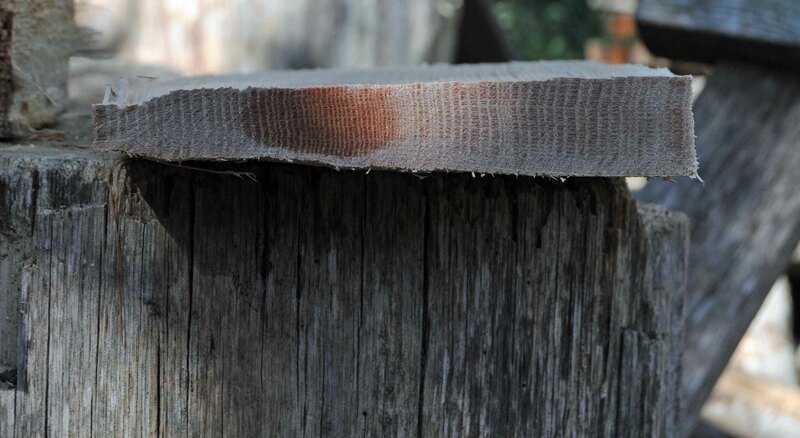 This is thick, hard crusty bark. 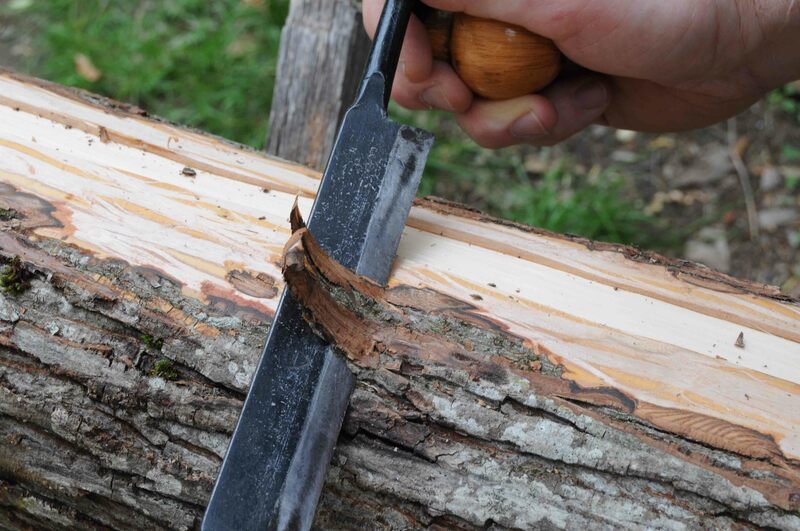 Here is a detail, showing as I shave off the outer bark, the inner bark we’re after is exposed. In this photo, the first strip is removed. 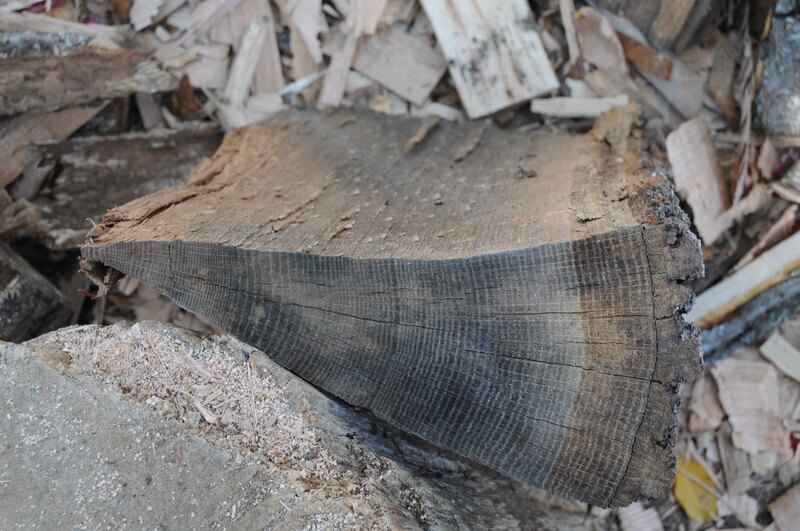 That way, I can see the thickness of the inner bark (or “bast”) – this becomes important. 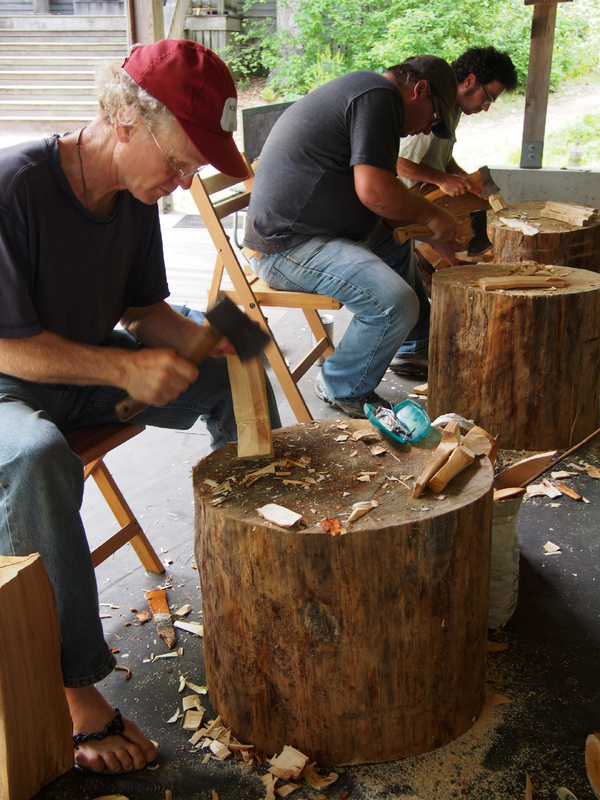 so next is the task of thinning the inner bark to the appropriate thickness. This is a finesse move. 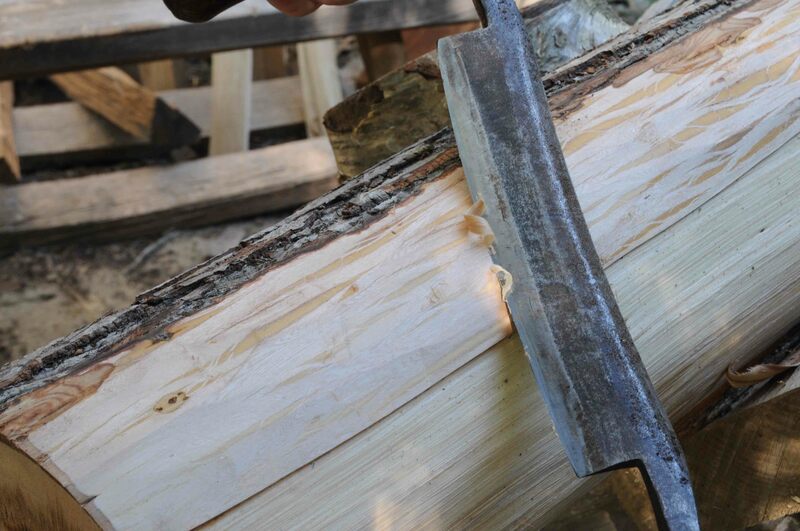 Below the drawknife here (bottom left of the photo) the bark is just about the right thickness – above the knife you can see the yellow/orange striations – I use those as a visual guideline – shave them away & you’re there. Just about. 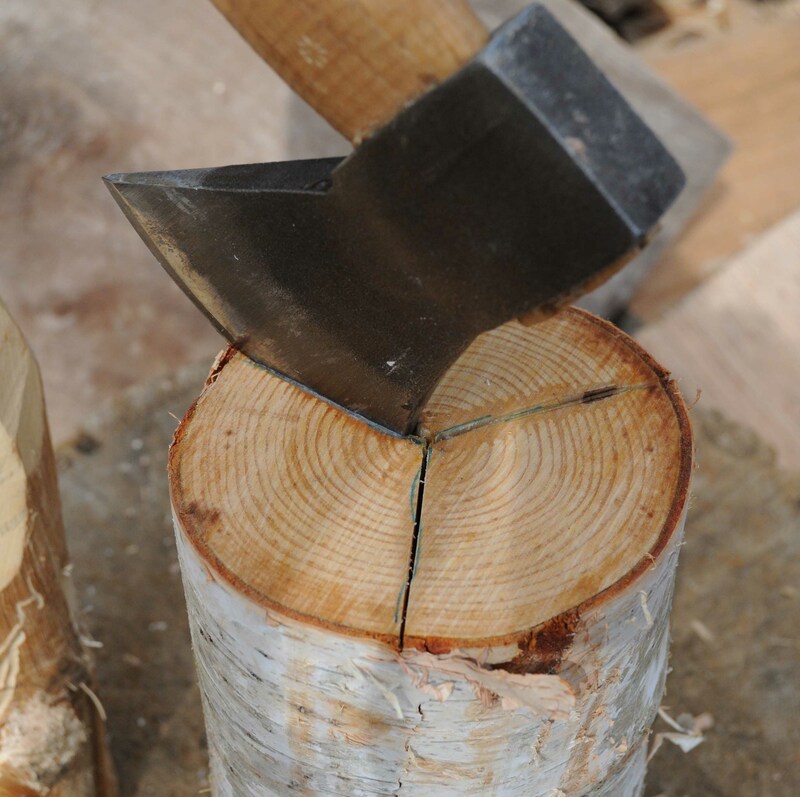 Then I score through the inner bark down to the wood with the tip of my knife. I make the strip about 3/4″ – 1″ wide. 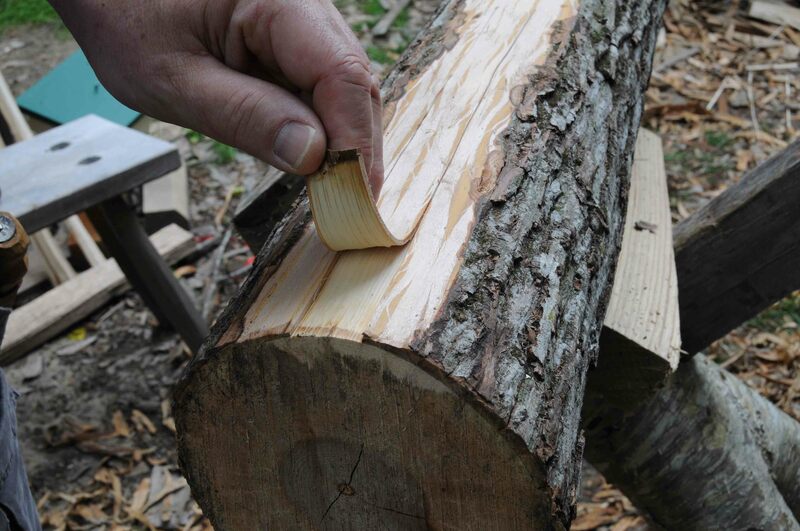 It can wiggle with the grain of the tree…try to keep it pretty straight. But they are wider than I’ll use them, so I can trim them some when I get to weaving with them. Then peel the strip up. Never ceases to amaze me. I keep close watch for stray fibers that might stick to the tree. Usually means the scoring wasn’t deep enough. You can slip your knife under there & re-establish the peeling. Some strips are too thick when you take ’em off the tree. You can sometimes split them apart. 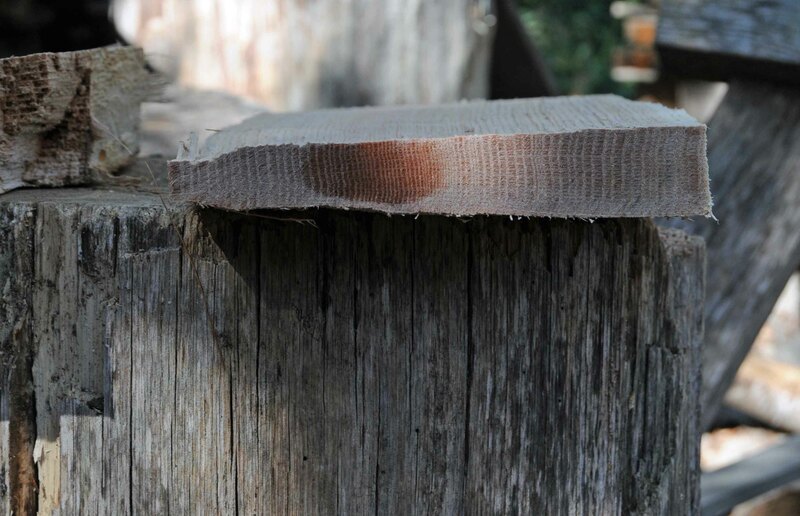 I scored across the bark to form a tab, then pulled them apart. This is slow, careful work – you have to watch to see if it’s going evenly. Any thick side, pull towards it. Just like riving. 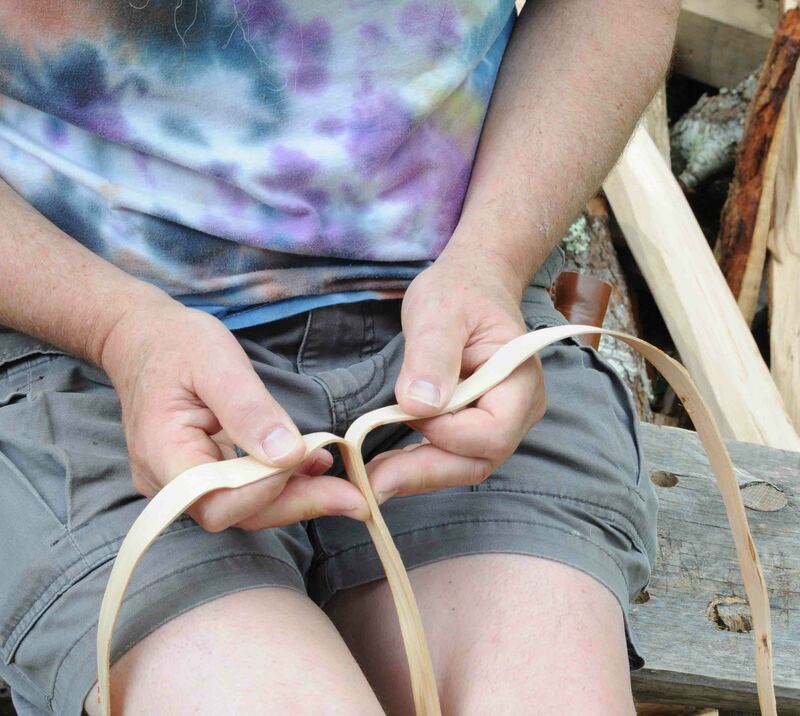 I hold the strip between my knees, then use my thumbs & forefingers to peel them. My other fingers help keep things peeling evenly. 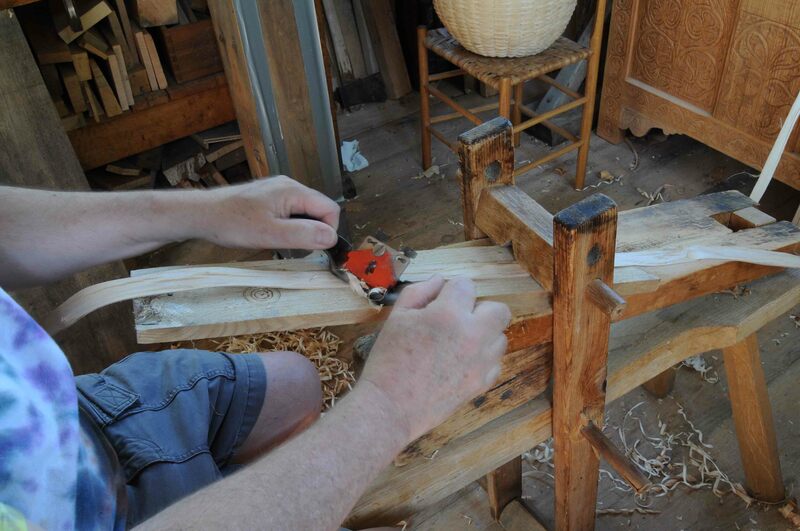 If a strip is too thick, but not thick enough to split, I put it on the shaving horse, and shave it with a spokeshave. I put a support stick under it. You can shave this later, once you’re using the material – but I find it best to do it right off the bat. 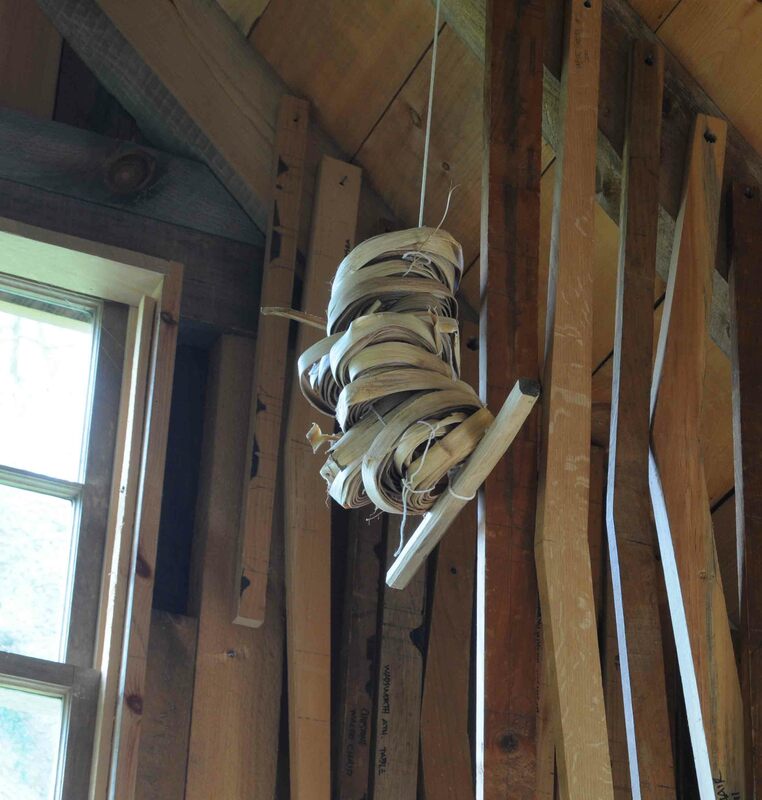 Coil ’em & store to dry in an airy place. 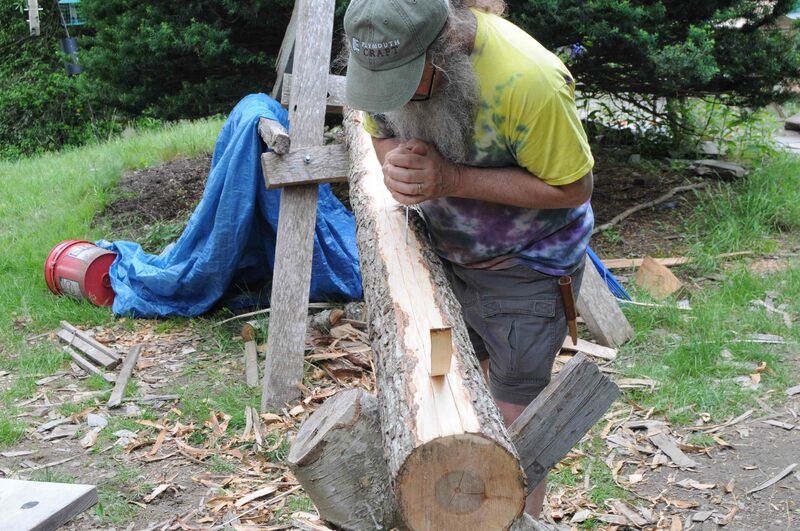 The first log was clear enough for some long riving & bending wood. 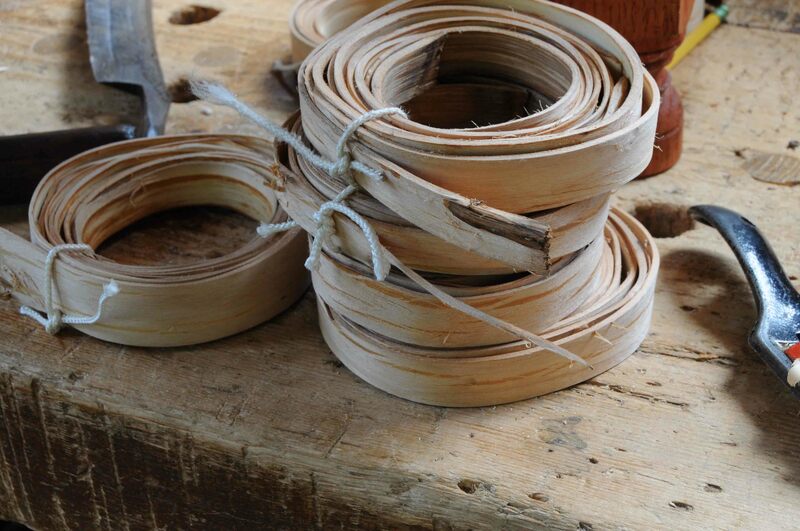 I made some basket rims, then shaved two of these bows for firewood carriers. This one is shaved to shape, steamed & bent onto this form. I took no pictures of any of that. I shoot my own photos, and steam-bending requires complete attention. 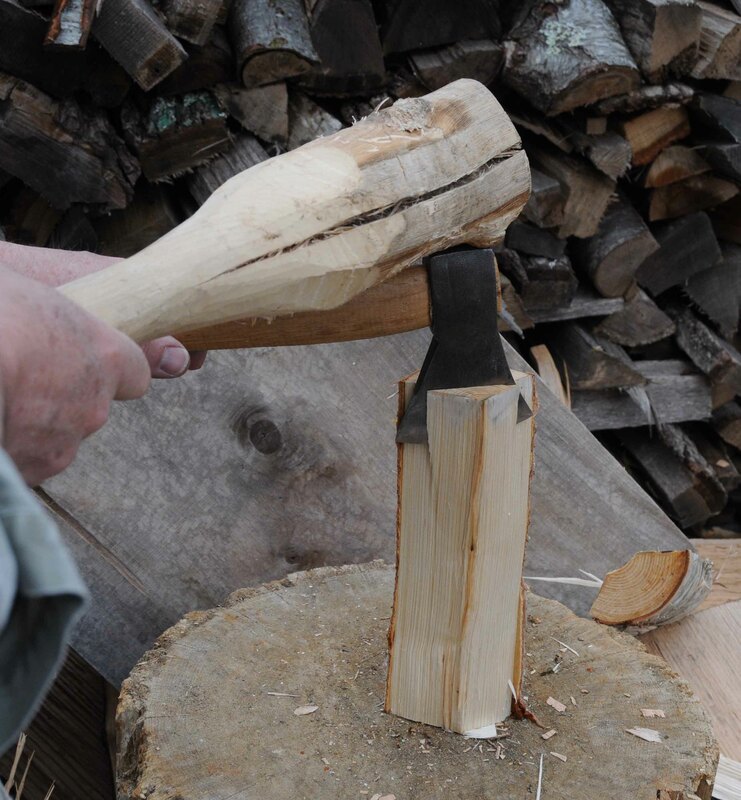 This firewood carrier is detailed in Drew Langsner’s Green Woodworking – as is peeling hickory bark. 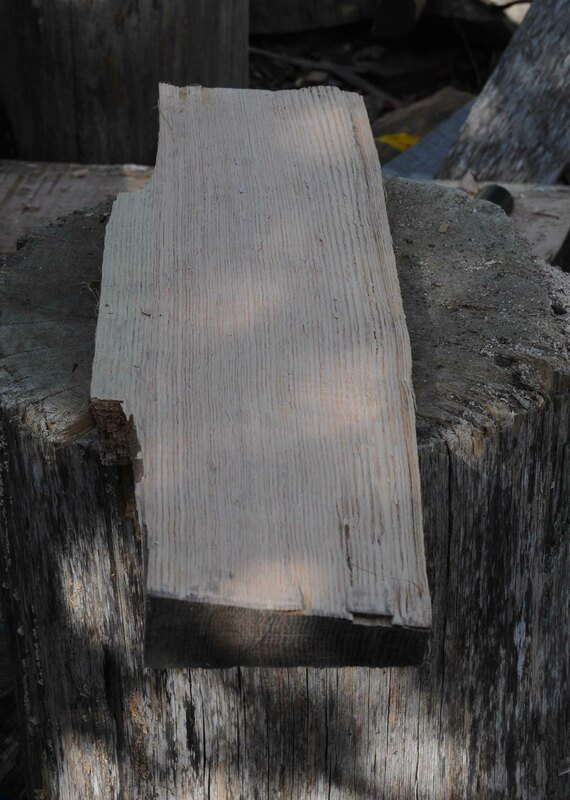 The base will be an open framework, this board is just the drying form for the bend.